We support the California Public Utilities Commission decision of giving residential customers a choice in what type of electric meters they want at their home. 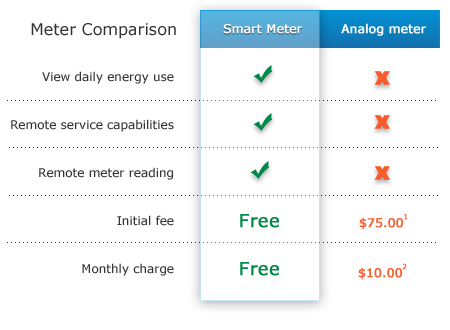 Residential customers may choose between a smart meter and an analog meter. 1 Income-qualified customers pay $10 initial fee. 2 Income-qualified customers pay $5 monthly charge. Please note that smart meter-enabled benefits will be discontinued if you switch to an analog meter. In December 2014, the California Public utilities Commission (CPUC) issued a decision that affects the frequency of meter reading for opt-out customers. As a result starting in April 2015 SDG&E began reading smart meter opt-out legacy meters every other month. You will receive an estimated bill for the months in between. Generally estimated bills are based on usage from the previous month and the same time last year. If your usage has changed this could cause some ups and downs in your month to month energy bills. If this does happen to your billing, you can join our Level Pay Plan (LPP). Or in the months that you receive a bill based on a physical read, and the previous estimated bill appears to be out of line in comparison, please give us a call. More information is available at the CPUC website. Learn more about smart meter benefits. For your convenience there are multiple ways to opt-out of smart meter. Opt-out using our online form. Submit your opt-out request by visiting one of our branch offices. You may also opt-out by phone by calling at 1-877-357-8525. A $75 initial fee, as well as a $10 monthly charge for a three-year period. Income-qualified customers pay a $10 initial fee, as well as a $5 monthly charge. The monthly charge will be billed for a period of three years from the opt-out enrollment date.